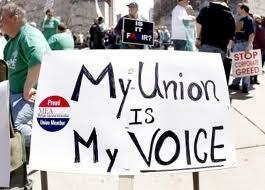 "The passage of a so-called “right-to-work” law in Michigan recently left the labor movement feeling gut-punched. "The law, which defunds unions by allowing workers in shops represented by a union to opt out of paying for the cost of representing them, was a blow at the once-mighty unions that made manufacturing work, particularly Michigan's famed auto manufacturing, a middle-class career. It came in the heart of union country, and while after Ohio and Wisconsin (not to mention RTW's passage in Indiana last year as well) it was hardly a surprise that the wealthy businessmen who fund the Republican party wanted to destroy the labor movement once and for all, the swift passage of the bill (in just days) despite the protests of thousands outside still felt demoralizing. "To make matters worse, it came on the heels of some of the most exciting labor organizing in years; the strikes of hundreds of workers across the country at Walmart stores and warehouses, the strikes of fast-food workers in New York and similar organizing in Chicago. It came not long after Chicago's teachers union struck and pushed back against a wave of corporate-backed education reform policies. "While Michigan's unions regroup and begin the twin processes of trying to survive and retain dues-paying members in the face of RTW and trying to find a way to overturn the law, it's clear that the national labor movement needs to do more than just fight defensive battle after defensive battle." “'Don't mourn, organize!' says Milkman, whose research has focused both on the American auto industry and recently, on low-wage immigrant workers. 'Forget the NLRB system,' she continues; that system has become largely dysfunctional for the workers who are covered by it, and for many it's simply not a question—they're not included in its protections, so they have to find other solutions. “'We're living with the consequences of a movement that ceased being an economic justice movement,' Fletcher says. To get back to those roots, he's advocating some serious change and rebuilding for labor. "It's about organizing politically in neighborhoods and communities where union members are and building leverage that way rather than depending on a party. "McAlevey points out that the entire structure of work has changed over recent years. That means that there are many workers who don't see how unions could work for them, and who have to be reintroduced to the entire concept of unions. 'The way that unions can keep any kind of skin in the game is by rethinking their relationship to their own rank and file and rethinking their relationship to their broader community,' she says. "This kind of work can be done, she notes, and must be done—the same way unions put together a Get-Out-The-Vote machine for presidential elections. "When it comes to organizing under so-called 'right to work' laws, Robertson and Speight know all about it. 'What Scott Walker tried to do in Wisconsin is our status quo here. 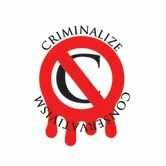 In Georgia, there's no recourse. You can literally be told "I'm firing you for that union button, get out." There's no board to petition for unfair labor practices. The only ability we have to organize is the discretion of the employer,' Speight says. “'We need to teach people, even longstanding union members, in practice what collective action looks like, how do we identify targets, how do we escalate tactics to make those targets say yes.' To get there, he notes, labor needs to 'embark on a deep relationship-building effort with our allies, so that struggles, attacks on labor are not viewed as an attack on labor in isolation, but are viewed as attacks on fundamental democratic rights.'" 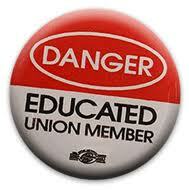 The fifth item is one that should be examined by anyone interested in taking part of union organizing. 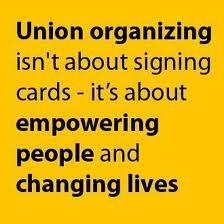 Approach a union of your choice and offer to volunteer for projects identifying those workers badly in need of a union. 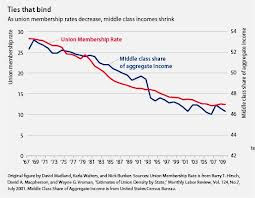 With the decline in membership since the Reagan union-busting era, unions are cash-strapped and should welcome anyone eager to help build up their memberships. 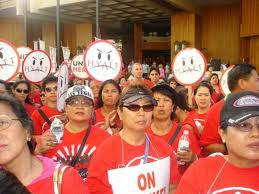 If you live in a resort area, for example, unions specializing in hotel workers will probably need volunteers to help out in their research departments, identifying the hotels by the size of their employees to facilitate organizing. If you have contacts in one of those hotels, you could even be the one to infiltrate them, starting the drive for unionization. It doesn't take much to convince the non-union workers that they are getting the short end of the stick: just show them the difference in pay, benefits, and seniority between non-union and unionized hotels. The Conservatives have decimated unionism in the U.S., and the lowered income and standard of living that accompanied the reduction in union membership is proof that the Conservative machinations have been deliberately put together to plunge the middle class into poverty - and the resulting starvation, illness, and death of the American worker.